Whenever I begin to champion this album, I always commence with an apologetic disclaimer and this review will not diverge from that well-trodden path. It must be stated, that the original Ultravox line-up, fronted by John Foxx, bore no resemblance to the later, ‘Slick’ - Viennese-rollers fronted by that chameleon of popular culture – Midge Ure. 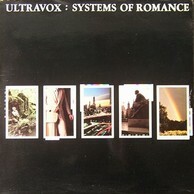 When ‘Systems of Romance’ was released in the late summer of 1978, Ultravox had already released two previous albums. The first being; ‘Ultravox!’ (1977) released at the height of punk. This Eno produced, Bowie influenced record saw the band slated for their unfashionable cyber-punk stance. The follow up ‘Ha! Ha! Ha!’ released in the latter end of the same year was a harder, ‘punkier’ affair, but the final track ‘Hiroshima mon Amour’, revealed a new, romantic element to the band, out went the pseudo-goth lyrics, and in came European, mechanic sensibility. I had loved the cover of ‘Ha! Ha! Ha!’ the misaligned, 3D starkness of the band, reeked of un-Romanised punk imagery, but yet it contained a psychedelic aloofness that was despised by the music press. John Foxx had planted a seed in my head at the end of Ultravox’s last album and I anticipated, what I hoped would be the greatest album ever recorded. My wish that this new album would follow the direction of ‘Hiroshima mon Amour’, was fuelled by the fact that Stevie Shears, the ‘punk’ guitarist had been replaced by a - ‘long-hair’ Robin Simon. On the day of its release, I was not disappointed. ‘Systems of Romance’ was recorded by Conrad Plank at the legendary Krautrock producer’s own studio near Cologne. At the time of recording (1978), no one was producing music like this for it was considered pretentious and unfashionable in the post-punk rock climate. ‘Systems of Romance’ brought together Plank’s Krautrock sensibility, a seasoned live-band, technology and a poet who had recently broken through into a pool of words and images that were fresh and meaningful. ‘Systems of Romance’ is a ‘stand-alone’ album, for it is difficult to place it into any given category. Its influences are diverse and it emerged out of nowhere and led to nothing, in the fact that the band split shortly after its release. Foxx’s first solo album ‘Metamatic’ was intentionally cold and mechanical and like many of his later solo albums, lacked the passion created by a band. Foxx’s muse was at its height on ‘Systems of Romance’, A heightened awareness of his surroundings, was embroidered with Renaissance influences, creating a tapestry of beautiful words that shone and glimmered over the thick, rich sound created by his band. His words influenced many, no more so than Gary Numan, who, in my view, stole his whole act, commercialised it and made a million. Foxx’s greatest mistake was leaving the band, for together their union was the key to their success. Although he did have a post-Ultravox hit with the single ‘Underpass’ his inability to move on, or to develop upon the enchanting lyrics he created for ‘Systems of Romance’ was to be his greatest bugbear. It is sad that the band is remembered only for its post-Foxx releases. So, rid yourself of images of pointy sideburns, Carol Reid imagery from post-war Vienna and take another listen to this ‘Krautrock’ masterpiece, that influenced many including, Japan and many of the ‘80’s new romantic acts. Slow Motion: The album begins with the single ‘Slow Motion’ and the introduction of Robin Simon into the band reveals a guitarist, whose ability is multi-dimensional. As we are welcomed to John Foxx’s blurred, moonlit world, we hear crazy freak-outs in the depth of the song, reminiscent of something off Amon Duul II’s ‘Yeti’. Yet somehow, Plank has managed to merge the synths and the guitars to create a distinctive, rich wall of sound, unique to this album. The thin sound of previous albums is immediately dispensed with and this thick synthetic haze is underpinned by Warren Cann’s solid metronomic drumming. Layered themes emerge and then disappear to form a rich, textured brew. I Can’t Stay Long: The riffy guitar rides over strange loops and a krautrock bass and the track reveals Foxx as a true poet. Lines like “In wintertime, overcoats close in, and the snow tastes of tin on the steps of any station. I need to glide, in the long green light of July afternoon….” Create for us a duel consciousness that creates for us a desire to experience the extremes of winter, but to experience them from the relative safety and security of a warm place. Again Cann’s metronomic drumming adds to the security theme, but his flourish of symbols at the end, reminds us of the human behind his discipline. Someone Else’s Clothes: A backward cymbal leads us into this shimmering track. Foxx’s unnerving, thin voice sound is accompanied by Simon’s choppy guitar, but unlike Ultravox’s previous guitarist Stevie Shears, Simon brings a multi-dimensional, looser sound to the band. Big bass notes accompany Cann’s unrelenting beat. This European sound is brought closer to home with Foxx’s quintessential Englishness. “Transfer me into the Saturday crowds, or merge me back into the factory towns…” is reminiscent of Priestley and the northern mill towns of yore. Blue Light: The odd track out, in that the lyrics are not reproduced on the sleeve and the track is strangely out of place musically. It lacks the depth of quality and production of the other songs and is reminiscent of tracks off later Foxx solo albums. Here Chris Cross’ tight bass playing dominates the subdued screaming guitar madness behind Foxx’s words. The song ends in a metaphoric rumble and suggests to me that this was one on Foxx’s later songs that crept onto the album, and suggested a mechanic direction that the rest of the band didn’t wish to follow? Some of Them: The greatest start to a track ever!? A choppy dysfunctional guitar creates the intro for a real rock out and reveals Ultravox as a tight unit. Guitars and synths fuse to create a tub-thumping track reminiscent of a ‘Ha! Ha! Ha!’ outtake. Quiet Men: Side Two starts with the second single from the album and is a stripped down track that burbles along to a Euro-beat, overlaid by Simon’s abrasive guitar and Foxx’s camp vocals. Billy Currie’s eerie synth introduces layered themes that drift in and out of the track, often slowing down and speeding up creating a richness and longing. Dislocation: A track built around strange metallic plucking, which hosts layered voices and bass synth. Foxx’s nonchalant, droning voice describes a disconcerting world between sleep and consciousness, set against the background rumble of the universe. Maximum Acceleration: One of the strongest tracks on the album begins as Foxx delivers the casual line “I thought you knew me by now”. Embellished by Simon’s shimmering, loose guitar that flows over a rock steady beat. Cann’s occasional tom-tom flourishes, especially at the end create feeling of total exhilaration. When You walk Through Me: From a rising synth, the songs bursts into life. Simon’s pivotal guitar rises over Cann’s fluid drumming which rises and then falls back into the tight disciplined performance, which has now become the trademark of this recording. The music drops away to a mechanic beat and over a fading synth, Foxx delivers his words as Chris Cross introduces a Krautrock bass line that leads us back into the song. Just For A Moment: Just like ‘‘Ha! Ha! Ha!’, ‘Systems of Romance’ closes with a track that takes the band into a different dimension. Here, unwittingly, Foxx delivers the final broadcast. His voice is thin and filled with longing, set against a heartbeat pulse and he wears the hat of the ‘outsider’. “We’ll never leave here – ever, let’s stay in here forever” he pleads as his voice, on the edge of distortion, calls from some distant womb like space. A discordant piano shatters the security of the track, breaking it into pieces, pieces that are quickly assembled as a church organ penetrates the gloom. As the organ floods the track, Foxx can be heard humming like a stranger in an old town square, somewhere in an old European city – maybe post-war Vienna?